LittleSyam: Carnival 1nita 21-22 Dec, KL Convention Centre. I am busy preparing LittleSyam products for 1nita Carnival will be held on 21-22 Dec at Kuala Lumpur Convention Centre from 9am-4.30pm. I'll be on stage as one of 1nita member spoke person and it is to share the experiences and benefit I had by participate in this programme with audience. I also will set up a booth to showcase LittleSyam products and services. 1nita is a community project that teaches women to use online platform as a way to expand their business and network. As to date there are about 1,000 1nita project participants nationwide. 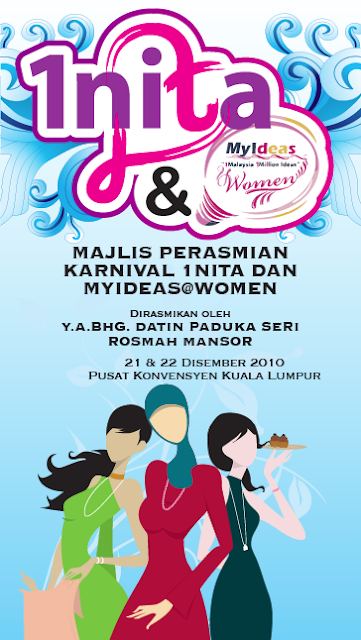 MyIdeas is a government effort which aims to encourage and bring together ideas from all levels of members of the public and to convert these ideas into best practices with the objective of improving societal and overall Malaysian life. You could bring your family to check on the event...many products will be displayed and to be sell.